K-pop fans are known for being passionate, devoted, and sometimes a little scary, but from a Westerner’s point of view they are also some of the most altruistic and generous fans around. We all know that K-pop fans give personal gifts to their idols at concerts and fan meetings, but the gifts that stand out more are the ones given to charity: be it money or rice or coal, that fan groups put together in their favorite idol’s name. For a K-pop fan from the US (and other countries as well, I’m sure), the idea of giving rice wreaths is baffling because there aren’t many customs similar to this performed for Western music artists or actors. Most often, when you hear about a charity in relation to a famous person in the US, Lady Gaga and her LGBTQ activities for example; it is the singer or actor themselves promoting the charity and giving their own money to the cause, not a fan driven project. It goes both ways in K-pop, there are K-pop groups that make it known that they support certain charities, but there are also fan groups that choose charities of their own volition. Sometimes it is whatever cause happens to be in need at the time (disaster relief, for example) or sometimes it is charities that have a loose association to an idol group, such as Jaejoong fans donating to protect Thai elephants because he happens to be fond of them. These donations mostly happen in accompaniment with big events for the idol or group, such as a big concert, movie or drama debut, or even big life events such as a wedding. Of the large donations, rice wreaths are one of the most common, with huge amounts of rice being donated to the K-pop groups and then later being passed on to charities, such as the Red Cross and organizations that help starving children. Instead of sending flowers, fans can send rice, coal briquettes, or eggs which will be used for something valuable in the community instead of simply being thrown away at the end of the night. Donations are also a way for older fans to shine in an otherwise youth dominated community. 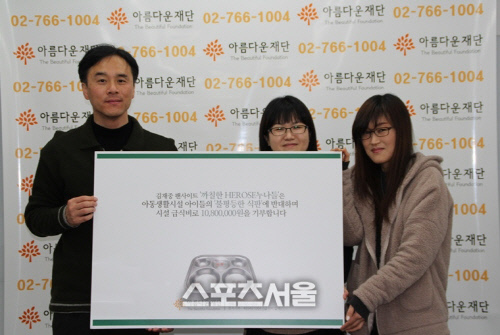 Some of the largest monetary donations have come from groups of “noona fans” and “uncle fans” donated in their favorite idol or group’s name. For a K-pop fan in their teens it may make more sense to buy one present for their personal favorite idol since it is more cost-effective for someone who may not have a job or only work part-time, but for adult fans who have jobs and more disposable income of their own it is easier to make a large donation to a cause that will shine favorably on their favorite idol (although I’m sure some of the more luxurious personal gifts for idols also come from this demographic). Some of the most prolific “noona fans” are groups dedicated to Yoochun and Jaejoong of JYJ, with both groups donating tens of thousands of dollars, mostly to help children in need. IU’s “uncle fans” have also donated large sums of money, most recently focusing on helping the elderly. 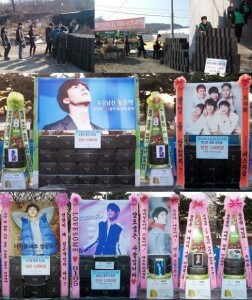 Rice wreaths, and other donations, are becoming a way for international fans to connect to their favorite idols as well. 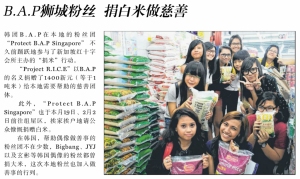 For B.A.P’s one year anniversary, their Singaporean fans donated rice in the group’s name, which, although it is a common practice in Korean, was a new experience for the Red Cross in Singapore where the rice was given. For fans from around the world that may not be able to ever meet their idols in person, donating to a charity can be a way to connect to these idols and do something in their name despite the distance. 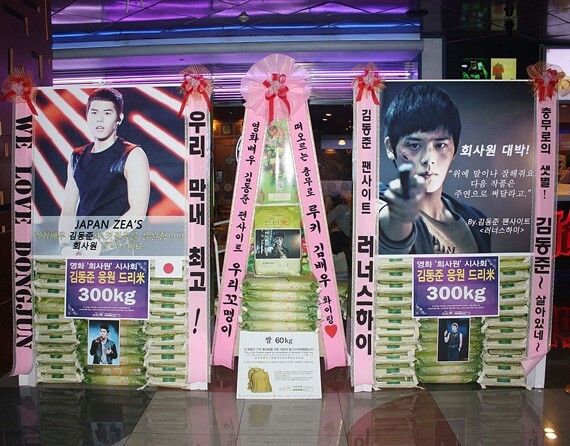 At the conference for Jaejoong’s historical drama Time Slip, Doctor Jin, there were rice wreathes from 31 different countries, proving that the generous practice of donating to charity in this way can be an international phenomenon. Although the fans are certainly the driving force behind these large donations, let’s not forget the inspiration behind these gifts; the idols. 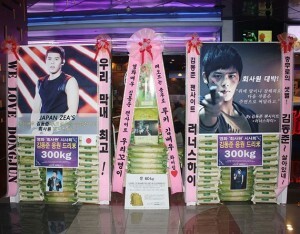 Although there have been examples of idols being greedy about personal gifts, the large donations of rice and money are often stated by the fans to have been inspired by the idol’s charitable behavior and philosophies. The most recent donation to B.A.P is said to have been inspired by Bang Yong-guk’s charitable works, and Jaejoong’s outspoken opinion on charity is probably one of the reasons he gets so many donations in his name. B1A4 is another group whose humble nature and wish to help people has spoken to their fans, their work for the blood banks for example, and likewise the group has received large donations on multiple occasions to be given to help people in need as well as animals in need. There are many things about the K-pop fandom that seem bizarre to someone from the US like me, and sometimes those things don’t make me proud to call myself a K-pop fan, but it is times when K-pop fans use their passion for their idols for the greater good that the overwhelming devotion K-pop fans exhibit doesn’t seem so crazy anymore. 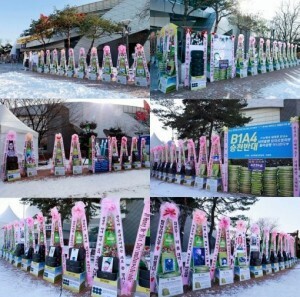 By taking a traditional South Korean practice, giving rice wreaths for momentous events, and applying it to the world of K-pop, fans are not only doing a service to their country through charity, they are also spreading a charitable practice to other countries through the love of idols. What do you think readers? 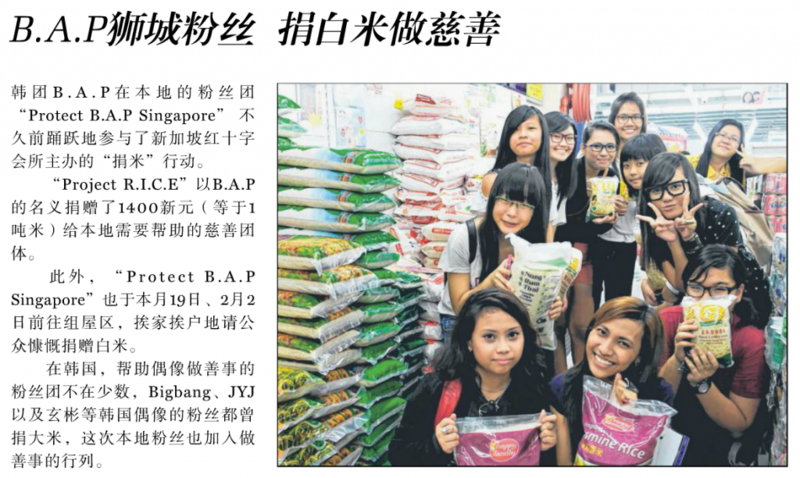 Would you want to give rice to charity in your favorite idol’s name?